To see any of these homes offline and in-person, just call (208-906-3370), text (208-906-3370) or email (team@northidahodreamteam.com) Chuck. [idx_listing_details listing=”12-668″] To see any of these homes offline and in-person, just call (208-906-3370), text (208-906-3370) or email (team@northidahodreamteam.com) Chuck. 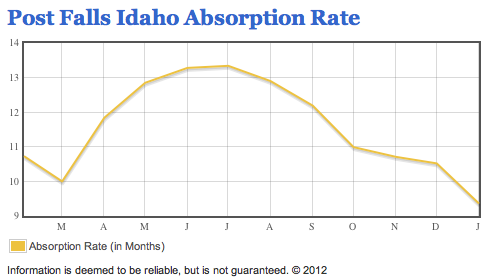 What is absorption rate and what does it have to do with me buying a home in Post Falls or Coeur d’Alene? To see any of these homes offline and in-person, just call (208-906-3370), text (208-906-3370) or email (team@northidahodreamteam.com) Chuck. [idx_listing_details listing=”12-666″] To see any of these homes offline and in-person, just call (208-906-3370), text (208-906-3370) or email (team@northidahodreamteam.com) Chuck. To see any of these homes offline and in-person, just call (208-906-3370), text (208-906-3370) or email (team@northidahodreamteam.com) Chuck. [idx_listing_details listing=”12-623″] To see any of these homes offline and in-person, just call (208-906-3370), text (208-906-3370) or email (team@northidahodreamteam.com) Chuck. To see any of these homes offline and in-person, just call (208-906-3370), text (208-906-3370) or email (team@northidahodreamteam.com) Chuck. [idx_listing_details listing=”12-613″] To see any of these homes offline and in-person, just call (208-906-3370), text (208-906-3370) or email (team@northidahodreamteam.com) Chuck. To see any of these homes offline and in-person, just call (208-906-3370), text (208-906-3370) or email (team@northidahodreamteam.com) Chuck. [idx_listing_details listing=”12-611″] To see any of these homes offline and in-person, just call (208-906-3370), text (208-906-3370) or email (team@northidahodreamteam.com) Chuck.